The build quality on this cheapie deck is nothing to write home about, but the DP-UB420’s video performance is magnificent for the money. 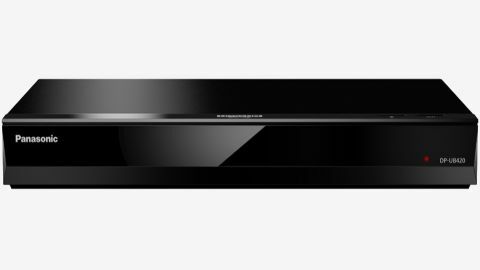 The Panasonic DP-UB420 isn’t going to win any beauty pageants - it has the cosmetic appeal of a biscuit tin, with a level of finish that doesn’t inspire confidence - but it could be the best value 4K Blu-ray player on the market. In fact, if value and performance are your only two criteria, the Panasonic DP-UB420 offers magnificent video performance at a reasonable price. Sporting a compact design, the player measures in at just 320mm wide - or around 12.5 inches for those of you who have yet to adopt the metric system - and weighs 1.4 kg (3 lbs). While that size and weight might scare you, for TV-centric home entertainment systems, where space is at a premium, this is actually a boon: The form factor is a lot easier to accommodate, alongside a games console or a dedicated media streamer, than a full-size Hi-Fi component. In addition to two HDMI outputs, one of which is an audio only output, there’s a digital optical audio output and Ethernet port, although you will still find Wi-Fi built-in should you find yourself unable to hard wire the player to your router. The perspex fascia clatters down when required, revealing an off-set disc drive and USB port. The supplied remote is appropriately half-sized, distinguished by a dedicated Netflix button, but there are also on-body controls for eject and power. In Panasonic’s player hierarchy, the DP-UB420 sits above the Panasonic DP-UB300 that came out in 2017, but still below the DP-UB820 and flagship DP-UB9000. But just because it’s been built to a price doesn’t mean it lacks interest: Beneath the lid, this budget player employs the same core HCX image processing seen on the brand’s top tier models, including 4K Direct Chroma upscaling. Certainly, usability is the same as its more expensive stablemates: The familiar-looking Home screen uses icons to access Video, Music, Photos, Home Network, Network Service and Set-up menu options are accounted for here. Playback compatibility covers 4K UHD Blu-rays and regular discs, as well as 3D Blu-rays, DVDs and CDs, however, there’s no support for high-resolution legacy formats like Super Audio CD or DVD-Audio ... but then that’s true across the entire Panasonic Blu-ray range. One cool new feature found here (and higher up the food chain) is an HDR optimizer. This allows you to moderate the deck’s HDR output to better suit your display device. Menu options include OLED, Super High luminance LCD, Middle or High luminance LCD, and Basic Luminance for projectors and low brightness sets. Although that all sounds a bit niche, it’s worth experimenting with, as it can have a material impact on the coherence of HDR images. While some manufacturers aren't offering streaming services on their players (Oppo never bothered with it, neither has Pioneer) Panasonic still has the big boys on tap: Netflix, Amazon Prime Video, BBC iPlayer YouTube as well as some minor other diversions. From a content hub point of view, then, it’s rather well equipped. Also on the cards, via firmware update is support for Amazon Alexa and Google Home, although neither were available at the time of testing. Intriguingly, despite its low price tag, the deck offers support for both regular HDR10 and HDR10+, the new dynamic metadata standard created by 20th Century Fox, Panasonic and Samsung, as a rival to Dolby Vision. And while it would've been nice to put these two formats head-to-head using Panasonic's hardware, there aren't any HDR10+ encoded platters available as the time of writing and Dolby Vision support isn’t available here. But, on the subject of HDR, the player features HDR to SDR conversion that's actually quite useful. Some low brightness displays and projectors that can't handle the ultra-dark black levels and HDR to SDR conversion combats that problem by converting the 4K HDR disc to a much easier to process SDR format. Also included in the menu options is an ability to convert HLG to HDR (PQ) for better compatibility with some displays. Impressive perhaps, but if you can find an HLG encoded disc you’re doing well. Similarly, there’s no indication that the iPlayer app on board UK spec players can handle HLG streams from the BBC. Image quality, regardless of the rudimentary cosmetics, is outstanding. There’s no obvious shortfall in image detail or wide colour handling, and the DP-UB420 can perform within a high grade system and look utterly convincing. Moreover, the player’s ability to display in-shadow detail is excellent, as there’s never any sense of extraneous noise or mush (a run through of Resident Evil: The Final Chapter, a particularly difficult UHD platter, proves that point). Similarly, home theatre audio, delivered via bitstream, sounds suitably immersive, while the more immersive Dolby Atmos format presents no issues. While you'll see the most value playing 4K media, the deck also does a fine job with regular HD discs - if you’ve got a big collection of standard Blu-rays, you can be confident they’ll look great here. If there is a caveat to the Panasonic's overall reproduction chops, it relates to audio performance: This isn’t a deck we'd choose to listen to CDs on. The presentation is hard and uninvolving. There is some mitigation with the provision of ‘tube amplifier’ sound filters, but that doesn’t change its basic sonic abilities. However, if you’ve moved away from CDs, then it’s a brighter story, as file playback is a good deal more involving. Compatibility covers high-res audio 24-bit FLAC and fancy DSD files, as well as more common WAV, ALAC, WMA, AAC, MP3 and AIFF. One perhaps less obvious consequence of the DP-UB420’s cut price build is operating noise. The DP-UB420 is not the quietest player in town, and although it wasn't audible above a surround system at moderate volume, it certainly won’t get any quieter over time. Disc loading speeds are reasonable - an ambitiously authored movie title took 43 seconds to get from tray-in to main menu, while a concert Blu-ray loaded in just 34 seconds . The DP-UB420 may not be a battleship grade disc spinner, or even particularly attractive, but when it comes to home cinema performance for the price, it’s outstanding. The video engine at the heart of this player is extremely competent, and as a source component in a system build around a 4K TV, with or without home theatre audio, it can only come highly recommended. It also doubles as a High-Res Audio file player, but if you have a large collection of CDs it’s probably worth investing in a more expensive deck with more obvious musicality. In spite of a few caveats, the DP-UB420 is a bit of a bargain.